Unlimited complimentary access to 1000+ airport lounges worldwide for you, your supplementary cardmembers and one free guest each. Enjoy complimentary golf once per month at any time during the week including weekends. 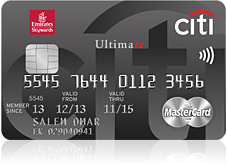 Please visit www.mastercard.com/worldelite to find out more. Complimentary DISCOVERY Black-level membership, across 550+ hotels including Anantara, Corinthia, Kempinski, etc., through the loyalty programme of Global Hotel Alliance, to enjoy room upgrades, early check in, late checkout and much more. 1.25 Skywards Miles per USD of FX spend. 1 Skywards Mile per USD of local spend. Disclaimer: Please note you may earn Skywards Miles up to the credit limit assigned to your credit card and earning caps apply for certain spend categories (i.e. e-Government, grocery stores etc.). Please click here to view the Skywards Miles earning terms and conditions. Average savings values calculated are based on an average customer spend and usage uptake of each mentioned benefit. Click here to know more.